Our commission system is the last missing feature needed to turn your Guru site into a fully-fledged learning platform like Udemy. 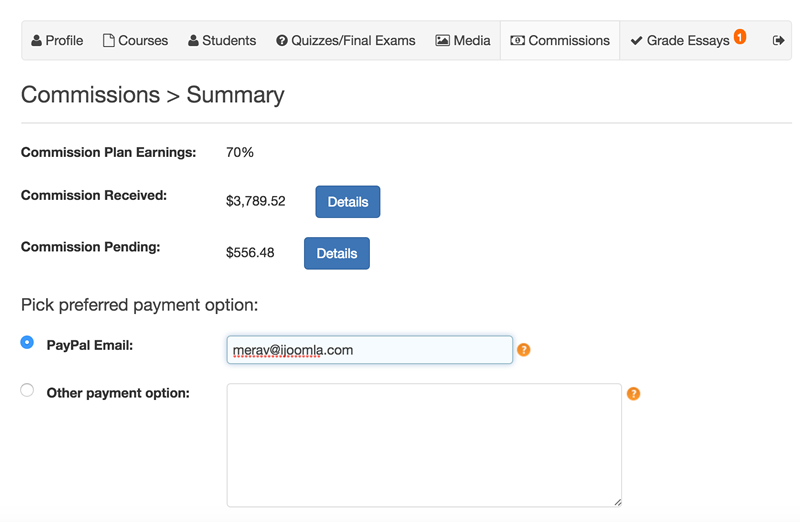 It lets you set teacher commissions, track sales and pay teachers easily. The new commissions system can be personalised for each teacher separately. 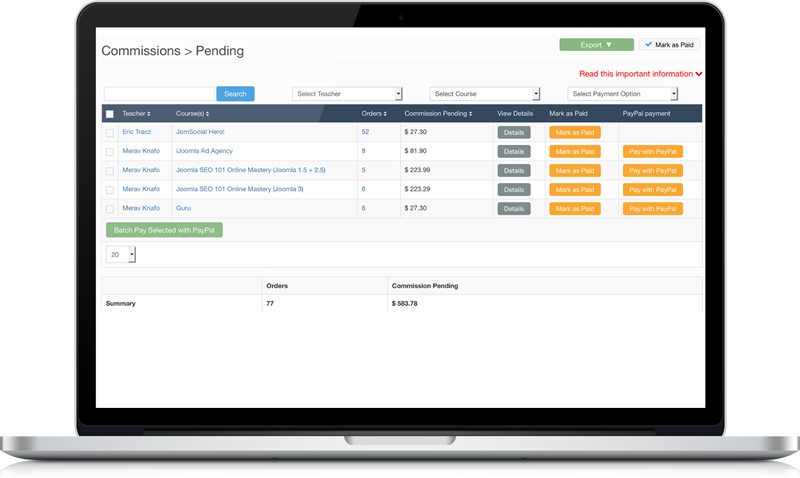 It produces reports, and has a batch payment option to send money through Paypal to your teachers. It will give you and your teachers more structure, more information and greater clarity — and it's easy, transparent and fabulous. 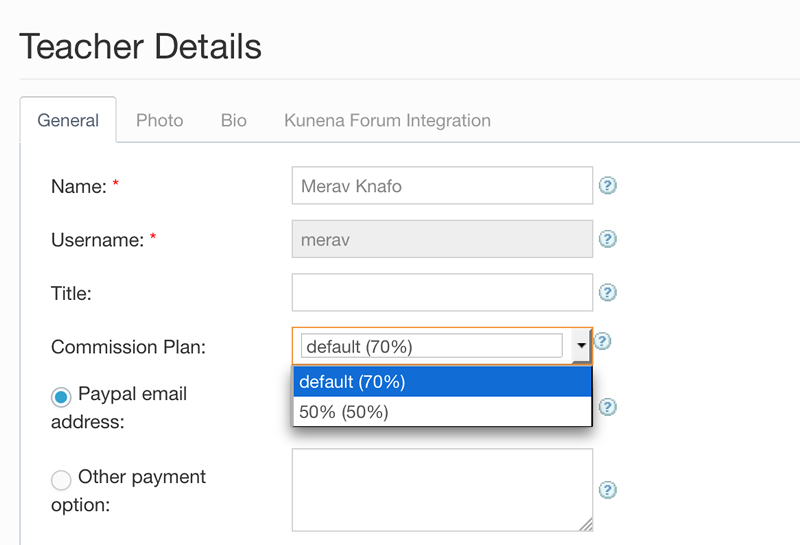 To add a commission plan, open the backend of Guru and navigate to Settings > Commission Plans. You can create as many commission plans as you like, and set a default commission system for all new teachers too. By giving each teacher a different commission plan, you can negotiate teacher earnings individually. Offer discounts? No problem. We take the price of the course, subtract the discount and calculate the commission based on the amount actually paid by the student. It's only fair. You can change the commission plans for your teachers at any time without affecting previous plans. So if a course was purchased when a teacher was on a previous rate, their commission will be calculated based on their old rate. All future purchases will be calculated based on their new rate. It's really brilliant. We've also made paying simple. Just click on “batch payment” to pay all your teachers at the same time with PayPal. Don't forget to mark the selected commissions as paid. Teachers can set their own PayPal email addresses, and if they've registered with a different address, we give them a dedicated field. In previous versions of Guru, the promo codes system worked globally. Now you can set a promo code to work for just one course. It fits beautifully into the commissions system. The commission system is full of ‘export' buttons, allowing you to download any data you like: history, pending commissions, details of already paid commissions… everything. It's insanely easy and useful. You can export to CSV. Your teachers can export their earnings reports on the front end as well. Teachers want to know exactly how much they're earning. Guru's new system lets them track the orders. They can see how much they've already received, the details of those orders and how much is pending withdrawal. Teachers can see their pending commissions any time they want. We give teachers a history of what they were paid, when they were paid and what the payment consisted of. It's simple and detailed, and comes all wrapped up in a clean design that's easy to navigate. If a teacher doesn't have a Paypal account, they can ask to be paid by bank transfer, Western Union, and a bunch of other methods.